Quarterly, first and fourth, Blue with a silver bend between three frases with a square containing eight pieshaped slices gold and black, in second and third quarters silver with three red crowns. Motto Translated: I am ready. 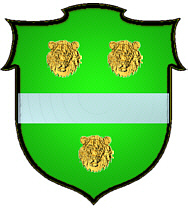 Coat of Arms: Green with a silver stripe between three lions faces. Love, Mackinney, Mackinning, Kackinvan, MacMorran. 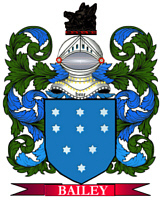 The MacKinnons claim their descent from the royal family of Kenneth MacAlpine. The clan slogan of “Cumnich Bas Alpin” or “Remember the death of Alpin” refers to the great-grandson of Kenneth, who was slain by Bruch, King of the Picts, in 837. 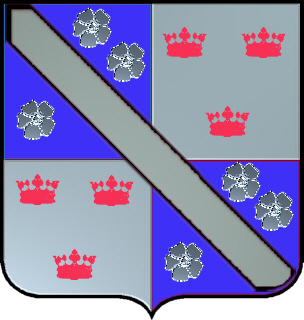 His son Fingon, or “fair-born” is hailed as the progenitor of the clan.